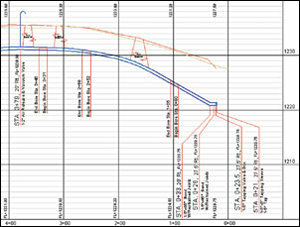 A new water main profile superimposed on a new street design profile. Oklahoma City, Oklahoma, is called the Heartland City. Its population of more than 500,000 resides on 621 square miles, making it one of the largest cities in land area in the country. Museums and memorials abound. The Oklahoma City National Memorialbuilt "to remember those who were killed, those who survived, and those changed forever" after the 1995 bombing of the Alfred P. Murrah Federal Buildinghas had more than one million visitors since its opening in 2000. With plenty of water, no vestige of Oklahoma City's dry and despairing Dust Bowl days of the Great Depression survives. In the early 1990s, the city fathers evaluated the city's evolving needs relative to its predicted rapid growth and determined that GIS would be of great value. Following an involved evaluation period, the city installed several licenses of ArcInfo Workstation on a UNIX-based platform and over the years has built a comprehensive GIS, which is utilized by a variety of departments. In building its GIS, the city wanted to ensure that the GIS could be used not only for planning and general information analysis purposes but also for in-house engineering design applications. To accomplish this, the city had to create a very precise GIS, which at that time was a fairly unique approach to take. As a result, the city now has a comprehensive and dynamic database that is used to manage and meet the ever evolving needs of its infrastructure (streets, sewers, water, and other components). Recently the city migrated from ArcInfo Workstation to the ArcGIS Desktop environment on a Windows XP platform and converted its coverage-based GIS into an Oracle-based database. Oklahoma City has implemented an enterprise ArcGIS solution. The attainment of a successful, efficient enterprise was made easier because of a new technology introduced with ArcGISthe geodatabase. Two of the prime impacts of the geodatabase are the provision of an efficient environment for multiuser and multidepartmental use and the ability to store multiple data sources in a single database. The former is particularly applicable to public works agencies and to consulting engineers who provide services to such agencies, while the latter facilitates the management and maintenance of spatial as well as tabular data. Typically, the GIS department of a municipality maintains the municipality's GIS, while the public works department relies on the GIS department to provide pertinent information for planning and design needs. This sometimes can lead to a turnaround issue when a heavy workload can cause needed information to be slow in forthcoming from the GIS department to the public works department. This is when the geodatabase can provide a solution. Using the geodatabase, public works engineers can view or check out GIS information without assistance from the GIS staff and proceed with the application(s) at hand using the latest available GIS data. Since Oklahoma City's GIS is of engineering design precision, the Engineering Division of the Department of Water and Wastewater Utilities relies heavily on the use of GIS data. This data includes right-of-way, buildings, contours, water lines, wastewater and storm water sewer lines, and many other layers of data that comprise the city's basemap data. All of this information resides on a server to which the Engineering Division's engineers have access. From a central repository on the server, engineers are able to view and/or download information relevant to their work. One of the software packages used by the division is CEDRA-AVland from The CEDRA Corporation (Rochester, New York), an Esri Business Partner. This software package provides the city with civil engineering design capabilities directly within ArcGIS. To facilitate the map preparation process for use in the city's in-house design projects, the city Survey Department developed an extensive point and line coding scheme that, when processed with the CEDRA-AVland software, produces a complete, annotated, topographic map. Field surveys are conducted in the Oklahoma State Plane coordinate system so that survey information can overlay directly on the city's GIS data. 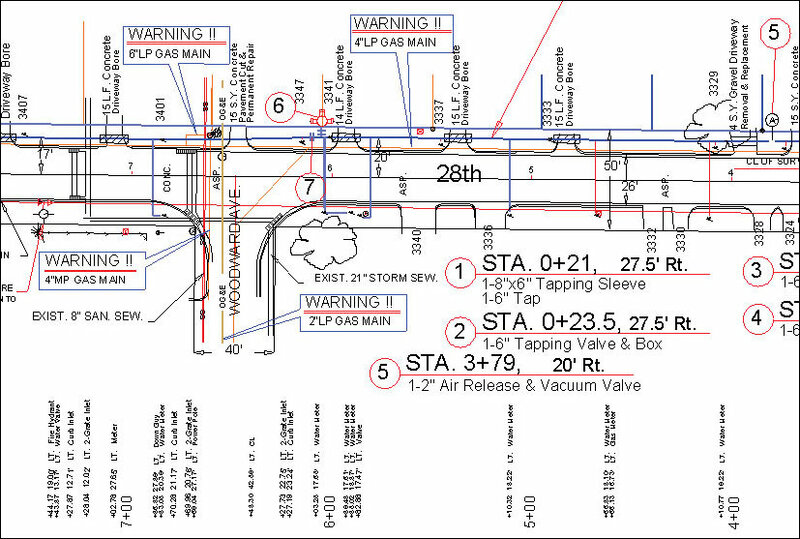 As part of the topographic map preparation, the city requires that existing feature descriptions (topographic notes) appear along, and offset from, the survey baseline. This approach leaves the plan sheet area within the confines of a new design available for construction information. This method of preparing base survey maps is common among many engineering design offices. With the topographic maps generated, the advantages of the geodatabase become apparent during the design process. 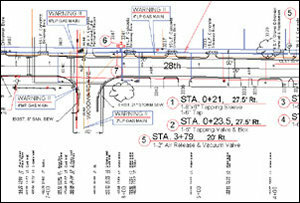 A typical Engineering Division project involves a street centerline, or an alignment. The CEDRA-AVland software creates a personal geodatabase (PGDB) for each alignment that is being designed. 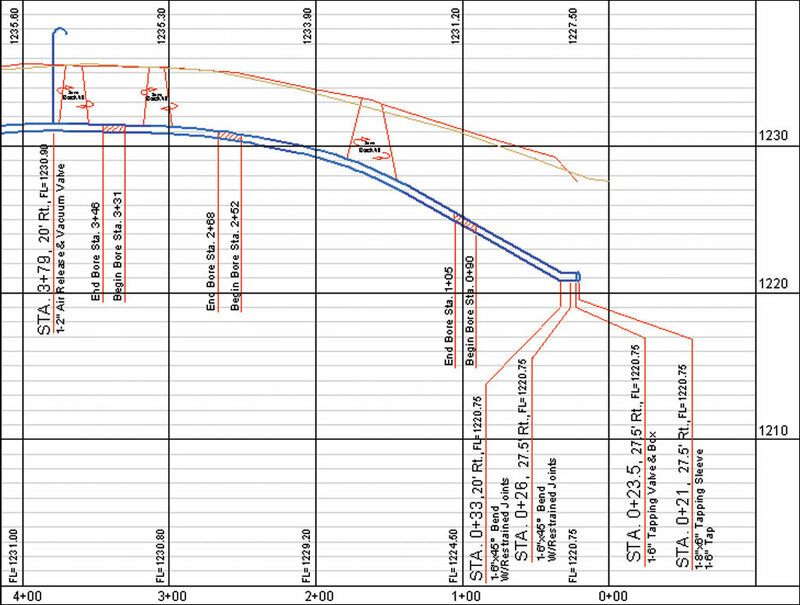 Within the PGDB, the software stores the horizontal geometry of the street alignment, its vertical alignment, cross sections, profiles, and all annotation associated with the street centerline. In addition, the information stored in the PGDB contains elevation data. As such, ArcGIS 3D Analyst can be used to display three-dimensional images of the project. Thus, the designer in a single PGDB has all of the relevant information associated with the street centerline with the individual components of the alignment stored as separate data sets. Working on a map document entirely within the ArcGIS Desktop products, an Oklahoma City engineer is able to interactively transcribe deeds, carry out general coordinate geometry (COGO), design roadway alignments, extract original ground cross sections and profiles along any alignment, design new roadway profiles, introduce typical roadway sections (templates), generate individual or multisurface (existing and proposed conditions) roadway cross sections, develop existing and proposed roadway contours and merge them to create a new ground model, and compute earthwork quantities. Applications, previously performed in stand-alone or CAD systems can now be performed within ArcGIS. Based on the principle that drafting should be a by-product of the design process, a major portion of the drafting of the new roadway design is done by the engineer during the design phase using CEDRA-AVland from within the ArcGIS Desktop products. The engineer focuses on the design process and, upon completion, produces the desired drawing information. This includes alignment stationing, horizontal curve and profile annotation, vertical curve tables, and any profile-related information. For more information, contact Sam Samandi, Water/Wastewater, Oklahoma City (tel. : 405-297-2422, e-mail: sam.samandi@ci.okc.ok.us), or Michelle Moore, The CEDRA Corporation (tel. : 585-232-6998, fax: 585-262-2042, Web: www.cedra.com). Also see "ArcGIS Used for Roadway and Site Design With Extensions From CEDRA."